Follow our chef instructions to cook your own meal in a fun four-hour-long learning experience. 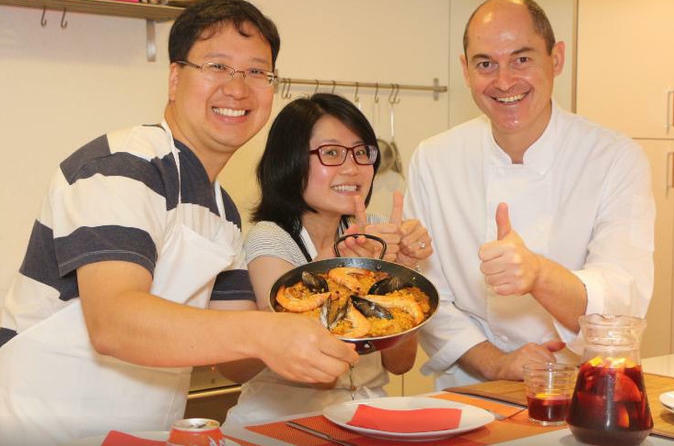 Along the class you will talk about Spanish food, eating habits or any other topic you can bring up. All meals are prepared in teams of two people, under the guidance of an English speaking local chef and require no previous cooking experience. If you come alone, we’ll try to find a cooking partner to pair up. Once cooking is done, you will have time to enjoy your meal with your cooking classmates while you share travel experiences. At the end of the class, you’ll get a recipe booklet including all the recipes made at the school, as well as a welcome gift with a premium Spanish product.